This particular form is derived from the double-spouted canteen in use since prehistoric times. The term "wedding vase" was given to it in the late 1800’s by Herman Schweitzer who handled the Indian arts enterprize for the Fred Harvey Company. At that time the pot was not used in traditional wedding ceremonies among Southwest tribes. However, in the years since it has become a traditional gift for young couples. Some stories say the two spouts sharing a common bowl symbolize two lives sharing a common destiny. 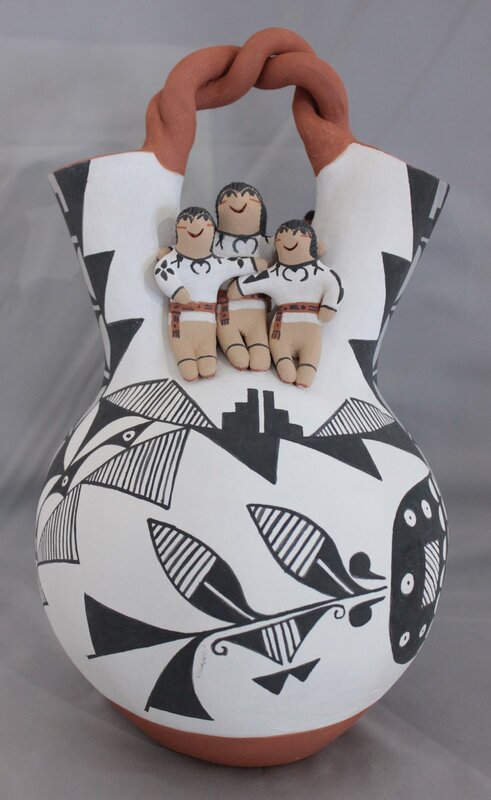 An interesting twist on the wedding vase, by Clifford Kim Fragua of Jemez Pueblo: the bride and maids of honor on one side and the groom and his best men on the other. 12.75 inches high. $485. TUCSON.